Philadelphia, PA -- Bradley Beal scored 21 points to lead seven Washington players in double figures as the Wizards cruised to a 119-90 victory over the Philadelphia 76ers on Wednesday night. The Wizards routed the Sixers without star guard John Wall, who was given the night off. Wall's replacement, Ramon Sessions, totaled 19 points with seven assists. Washington, which shot a franchise-best 65.3 percent in the wire-to-wire victory. "We got some really good looks because of our ball movement," said Washington coach Randy Wittman. Kris Humphries and Kevin Seraphin scored 12 points apiece for the Wizards, who have won four straight. Robert Covington poured in career-high 27 points to pace the Sixers, losers of seven in a row. Nerlens Noel had five points and eight rebounds before leaving in the fourth quarter with a sprained right ankle. The Wizards raced out to a 16-6 lead in the opening four minutes, prompting Sixers coach Brett Brown to substitute his entire starting five, a move that did little to quell Washington's hot shooting. "We started the game so poorly. We subbed our first group out quickly, try to find some life," Brown said. Washington shot 77.8 percent in the first quarter and built a 35-24 lead. Gortat had 12 points in the opening quarter on 6-of-6 shooting. 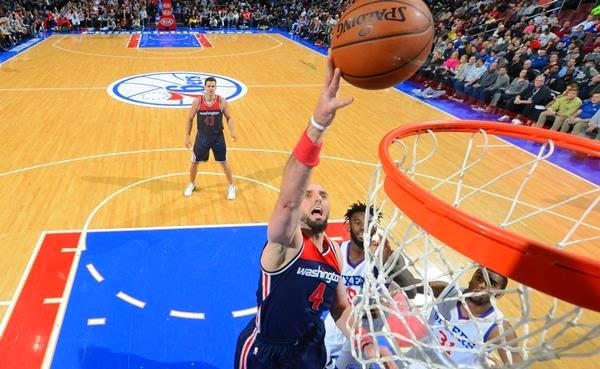 Philadelphia was able to trim its deficit to eight on a Covington 3-pointer early in the second quarter, but Seraphin hit a jumper and Rasual Butler knocked down a trey to put Washington up 47-34. The Wizards scored a season-high 70 points in the first half while shooting 72.2 percent and led by 16 at the break. minutes to go in the third quarter. Notes: Wall had played in 208 consecutive games ... The Wizards have won six of the last seven meetings ... Paul Pierce and Will Bynum each scored 10 points for Washington ... Jason Richardson supplied 17 points off the bench for Philadelphia.